With views to die for, Villa Castello is the perfect choice if you want a villa with panoramic sea views. This 3 bedroom villa has a spacious terrace and large, private heated infinity pool where you can lie back and enjoy this magnificent setting. 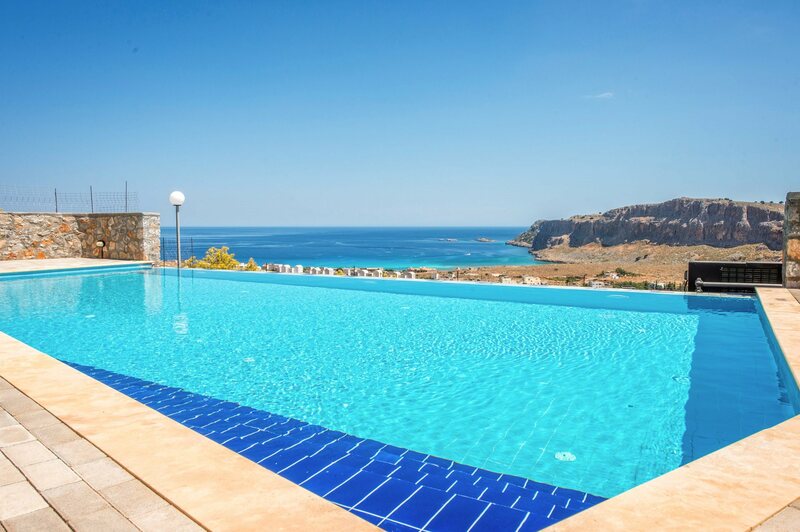 If you can tear yourself away from this terrific house, Navarone Bay, Pefkos and Lindos are all around 15 minutes' drive away, each having a beautiful beach and array of shops, bars and restaurants. WiFi, pool heating and air conditioning/heating in all bedrooms and lounge are included. What more could you want than having a relaxing swim in your own infinity pool whist watching the sun glisten in the sea - bliss! The outside space at Villa Castello is amazing. The large, private infinity pool takes pride of place, surrounded by the spacious terrace and framed by the fabulous sea views. There is a gazebo which provides some welcome shade and has a table with chairs. To the side of the pool there is a brick BBQ where you can cook a delicious Greek meze. Entrance to Villa Castello is via a hill. There is parking for 2 hire cars as well as a gate at the side of the house leading to the pool area. The front door is located under the covered terrace. The open plan living area is bright, contemporary and spacious. There is a L-shape sofa and 2 chairs facing the flat screen TV and feature fireplace. Just off the lounge is the well-equipped kitchen with a dining table and chairs and a door leading to the back of the villa . There are 2 sets of patio doors in the open plan area that lead out to the pool terrace, which also brings the sea views in. On the first floor there is a double bedroom with an en suite bathroom and patio doors leading out to a private balcony that has the most fantastic sea views. There is also 2 twin bedrooms, one of these rooms also has patio doors leading out to a private balcony with amazing views. There is also a shower room located on this floor. On the ground floor there is a WC. This villa is registered and licenced by EOT Greek licensing association. This number is: 1476k10000426401. Located in Navarone Bay, Villa Castello is in a superb spot mid-way between Lindos and Pefkos. This spectacular villa is around a 15 minute drive to the traditional village of Lindos and its array of shops, bars and restaurants. For a great day out Rhodes Town is a must! Full of history and with plenty of places to eat, drink and shop it is well worth a visit. Our villas Kallisti and Kristal are next door making these houses ideal for large groups. The village of Lindos offers a wide choice of shopping for every taste and pocket. A large supermarket is a short drive away just before Kalathos village. In Rhodes Town local markets are held on Wednesday and Saturday mornings, and offer an abundance of fresh and local produce. Lindos and Pefkos both offer a very large choice of bars and restaurants. If you wish to go a little further afield then Rhodes Town has plenty of choices to eat and drink to suit all pallets and you can also enjoy the true essence of Rhodes. The famous Navarone Bay is located near to Villa Castello, where you can enjoy the sandy bay and views of the iconic cliffs. There is also St. Pauls Bay a short drive away which is famous for the many wedding ceremonies which are carried out during the summer season. A short drive away are Lindos, Pefkos and Lee Beach, both perfect for a day out. If you head towards Lardos and you will find the mini-golf and go karts. The Waterpark is situated in Faliraki and you can also enjoy Water Land (inflatables at sea) at Tsambika Beach. Lindos Acropolis is a must to visit, either by foot or on a local donkey taxi. It dates back to 9th century BC. It is steeped in history and also offers fantastic views of the area. On the south-west coast of the island is Monolithos Castle, built in 1480 to protect the island from attacks. Access to the castle is by a staircase cut into the rock but it can also be viewed from the road side. The old town of Rhodes is contained within the city walls, it is a complex layout of approximately 200 streets. The Street of the Knights is one of the best preserved and most delightful medieval relics in the world. Afandou Golf Course, located on the main Rhodes-Lindos road, offers an 18 hole, par 73, golf course. It is open all year round. Horse riding, sailing, windsurfing and scuba diving are all available on the island. Villa Castello is not available to book for season as it is sold out. Take a look here at the Rhodes villas that are currently on sale. The Villa was amazing. It had everything we needed. The owner was lovely. Our rep was brilliant. Thanks Villa Plus for a great holiday. An absolute fabulous holiday. The villa was beautiful and totally perfect for our family holiday. The villa was excellent and beautiful, would recommend to friends. Very Good Villa, loved the table tennis table and pool table. Overall very good, thank you.